Dublin GAA Star Jason Sherlock joined Comedian Tara Flynn and Singer Song Writer Maureen Aku Disu to launch system for reporting racism. Dublin GAA star Jason Sherlock joined Comedian Tara Flynn and Singer Song Writer Maureen Aku Disu on Moore Street in Dublin yesterday, to launch Ireland’s new racist incident reporting system, iReport.ie, along with representatives from minority groups all over Ireland. The system is a new initiative from ENAR Ireland, a network of over 30 organisations working against racism in Ireland. Director of ENAR Ireland Shane O’Curry said, “Ireland needs to take racism seriously. 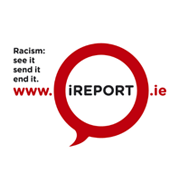 iReport.ie is a user-friendly reporting system which will give us a concrete data on the extent and nature of racism in Ireland. Most Irish people abhor racism and this is a tool to help shift away from a culture where people stand idly by”.